Life often takes us in unexpected directions. Michael Hodsden could never have anticipated ending up at American Bedding — and certainly not for as long as he's been with us! But we're so grateful that he's in the seat he has today because Michael is truly a Mattress Mastermind! There are many responsibilities to being in sales at American Bedding. Our salesmen coordinate almost every aspect of each order from the initial conversation with the customer to delivery completion. The process begins with discussing customer needs and/or wants, then progresses into a formal quotation process that puts numbers in their hands. Sometimes this involves numerous edits and requotes due to budgets, etc. and ends with the customer placing an order that is processed through our production department. I make sure that we have proper inventory, schedule shipping and delivery, and in rare cases, deal with any problems the customer may encounter in delivery. I had just left a job in October and knew Cliff Boggs from the church we attended at the time. He mentioned that American Bedding needed some temporary help through the holidays due a large order that they were working on at that time. I came to American Bedding as temporary help for a job that I assumed would last a couple of months until I found something else, and now I am working on my twelfth year here. I began here as a temporary employee in the manufacturing end of the business where I loaded trucks, built mattresses and any other job that I could learn. After a couple of months, I was offered a permanent position in production. After a little over a year in production, I was brought into my position in sales here at American Bedding. I currently also help in our marketing program, travel to various trade shows, and have helped to write content on our website in addition to my role in sales. Typically, our biggest challenge is the rare occurrence that we have a shipment or delivery that has damage or other issues as the problems are almost never in our control. It is our responsibility to ensure that they are taken care of to everyone’s satisfaction when possible. First and foremost, I enjoy providing for my family. However, I find a great sense of satisfaction in seeing and hearing the difference that can be made in an organization through the work we do. In a small way, we can feel like a small part of making a big difference to the nonprofit organizations we serve. I believe that almost everyone has already stated this, but I work with a fantastic group of people. It is also a joy to serve so many nonprofits who are providing such a valuable service to those in need. My faith and family are number one to me and the reason I do what I do. My roles as a husband and father are my number one priority. 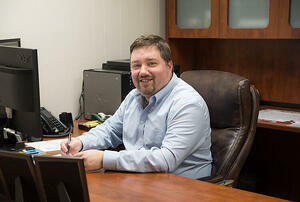 Ready to talk to Michael (or any of our other sales team members) about your interest in mattresses and bedding? Give us a call today, or click on the banner below to contact us online.